Protein kinase C is the target for the tumour-promoting phorbol esters, such as tetradecanoyl-β-phorbol acetate (TPA, also known as phorbol 12-myristate 13-acetate). 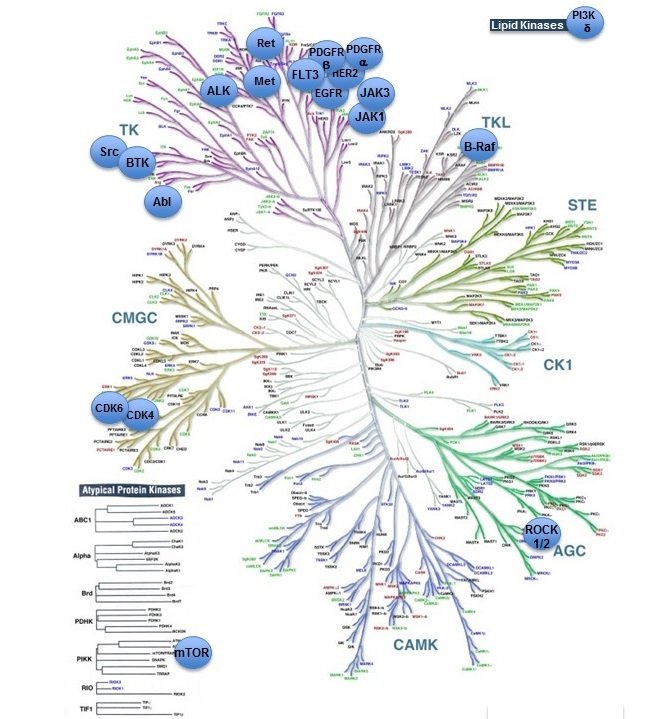 Classical protein kinase C isoforms: PKCα, PKCβ, and PKCγ are activated by Ca2+ and diacylglycerol, and may be inhibited by GF109203X, calphostin C, Gö 6983, chelerythrine and Ro31-8220. Novel protein kinase C isoforms: PKCδ, PKCε, PKCη, PKCθ and PKCμ are activated by diacylglycerol and may be inhibited by calphostin C, Gö 6983 and chelerythrine. Atypical protein kinase C isoforms:PKCι, PKCζ. Protein kinase C (PKC) family. Accessed on 25/04/2019. IUPHAR/BPS Guide to PHARMACOLOGY, http://www.guidetopharmacology.org/GRAC/FamilyDisplayForward?familyId=286.